Ok, I admit it… I’ll watch Beauty and the Beast once in a blue moon… you know, if I walk in and it’s already playing… and I wouldn’t stop someone from putting it on if they already had it out of the case… I mean, who am I to upset the apple cart if things are already in motion? So why is this post in the newly created Personal Health category? Well, I felt this was coming for a while, but today it hit me full face. I’m old now. Yep, gone are the days of youthful disregard for safety measures, blatant spite in the face of post-injury pain, and the ability to heal in a fraction of the commonly accepted time. I remember the days when I could ride my dirtbike all day long out in the empty lots and wooded areas behind my parents’ rural home, falling off or crashing into a tree every 10 minutes, and still keep on riding until sunset… then get up the next day and do it all over again. As I approached my late 20s I knew things were changing, and my body was starting to show signs that it wasn’t made of rubber after all. Bouncing back became harder, and injuries became stressful events as task lists and income deficits mounted while I was lying around trying to heal. But I always convinced myself that it was my own fault for carrying too much weight and leading the typical sedentary IT/tech life. I know it didn’t help to be out of shape, but it also wasn’t entirely to blame for my body’s lack of enthusiasm when it came to repairing itself. 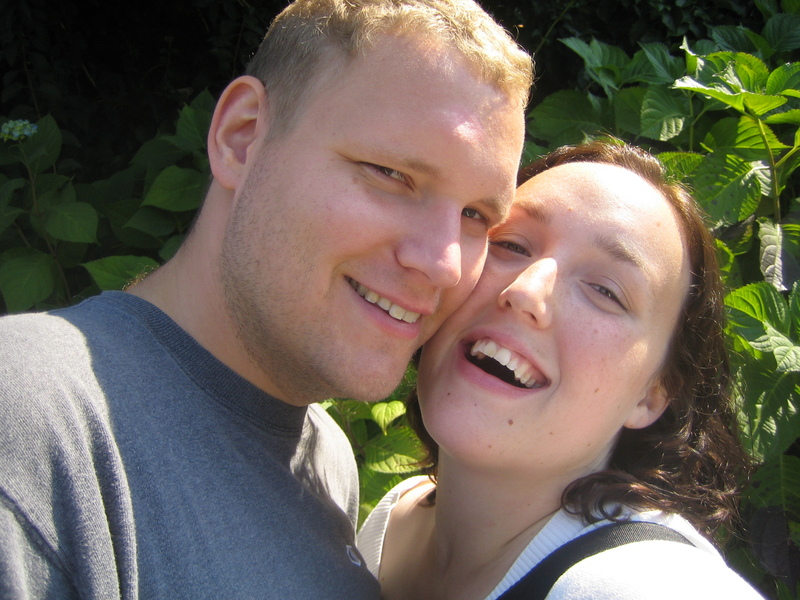 I’m in my early 30s now, and for a while there I was fit and happy. …and as many couples do, quickly transitioned from “fit and happy” to “fat and happy”. Well, my current fitness situation didn’t help me out much yesterday. In fact, I think it’s partly to blame. I’ve done some growing up a bit since the days of dirtbike riding, and so have my tastes in motorcycles. 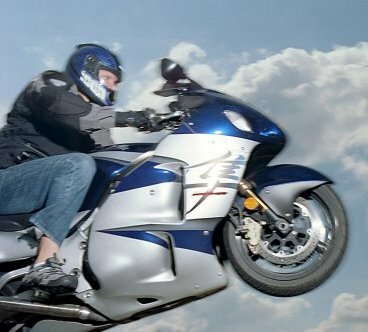 I currently ride a 2005 Hayabusa, which has enough speed and power to kill anyone foolish enough to push it. Fortunately for me, yesterday I was doing quite the contrary. I just had a new back tire put on, and was riding out of the service center parking lot… and forgot the number one rule of new tires on a sportbike; new tires need to be broken in. When I pulled out of the parking lot at only 5 miles an hour, as I turned right the rear tire kicked out from under me. As the bike laid down on to it’s right side, my natural instinct was to get really loose, let off the throttle, and stand up on the left peg so my right leg wouldn’t be pinned. Just as I was in the middle of completing that maneuver, the back tire caught traction and this heavy 1300cc sportbike that was only inches from hitting pavement on it’s right side, like a pole vaulter, stopped in it’s tracks and flipped entirely up and over, smashing straight down on it’s left side and tossing me up in the air like a circus clown. As I was coming down I tried to roll out of it and keep myself headed toward the curb instead of flat on my face out in traffic. I did a complete shoulder roll and ended up back on my feet right next to the curb, but I’m not as flexible as I used to be so I started off that roll by smashing my entire 280 pounds down on my left shoulder and ripping my scapula from my clavicle. It’s known as a type III AC separation. 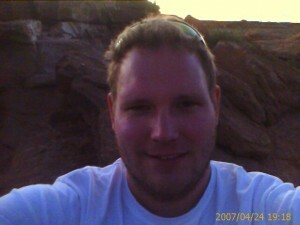 Of course, immediately after the accident I was totally numb. I knew something was wrong, and I wanted to get myself and the bike home as quickly as possible… before it really started to hurt. Like a typical idiot, I grabbed the bike and lifted it off the ground, which probably made things worse up in the shoulder region. At 5 miles an hour it didn’t really do anything to the bike but snap off the clutch handle about 1/4 way up and scratch up the ferring a bit. I got back on and rode home slowly, being mindful of turns and further opportunities for disaster. 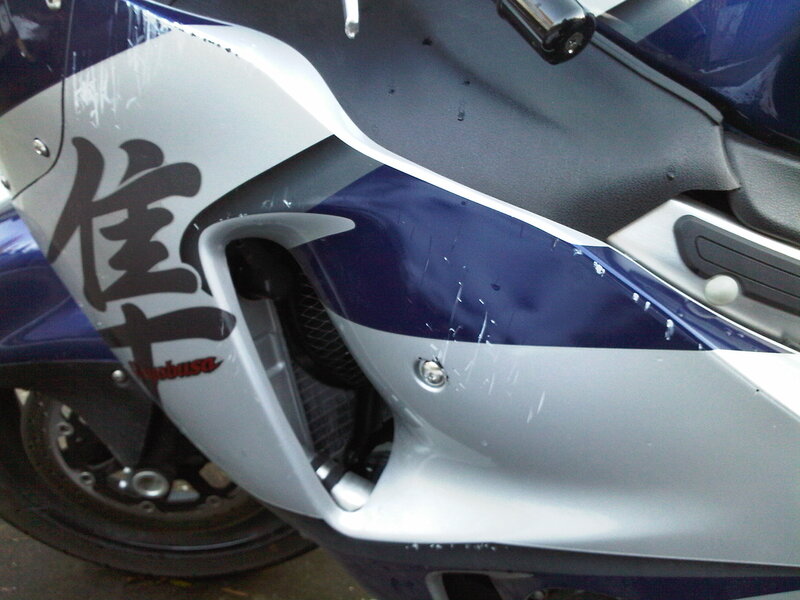 Once I got home I immediately took off my gear and inspected the damage. 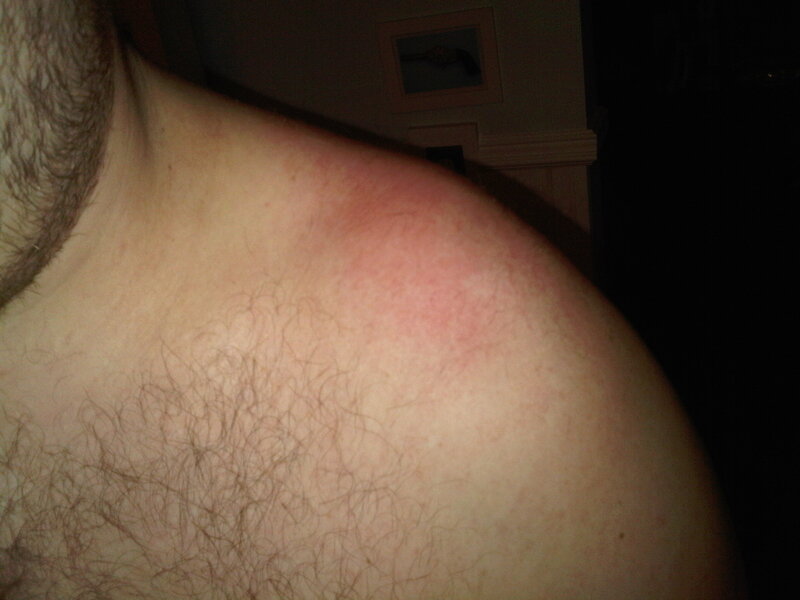 I had a huge bump coming up out of my left shoulder (bad angle in the photo), about half way between my neck and my shoulder socket and was hoping it was just a severe contusion. After a few cycles of ice and heat, I wasn’t feeling too much pain. It was late, and there was no way I wanted to pay the price to go to the ER, so I propped myself up on the couch and fell asleep. This morning I woke up and the bump was gone, but the arm was nearly immobile. If I so much as blinked I got a sharp knife-like pain in my shoulder. Well, I knew something was seriously wrong at that point and made an appointment to see the doc. I was hoping it was a broken bone… remarkably it was to be my first ever. Bones are amazing because they actually heal to a state stronger than they originally were. Nothing else in your body does that… nothing ever returns to 100%. Unfortunately my hopes were dashed after getting an x-ray taken. The image confirmed it, I had a classic 3rd degree AC separation. I completely tore my clavicle away from my scapula. This was not good news… but I guess it could have been worse. Luckily this injury is common among sporty types, and I found a few good resources out there that basically laid out a recovery plan for me. Even though it’s suggested, I don’t want to get any kind of surgery to repair the damage. Often surgical solutions tend to trade short term gains for long term problems, and I still feel my body, aged as it is, is the best repair specialist I know. So now I’m facing months of recovery, physical therapy, and possibly surgery if deemed absolutely necessary. All this has really got me thinking hard about my personal health and how I’ve been neglecting my body, it’s age, and all the new considerations and requirements that come along with it. So why am I posting these details in a public forum? I’m not sure really… maybe it’s because I simply can’t afford to keep my personal health and road to recovery a private matter. I’m certainly glad all those other people out there with AC separation injuries didn’t. This entry was posted on Wednesday, March 4th, 2009 at 11:58 pm	and is filed under Personal Health. You can follow any responses to this entry through the RSS 2.0 feed. You can leave a response, or trackback from your own site. OMG even at 5 Miles and hour your a crazy man. picked up the bike !!!!! The whole thing sounds like OUCH!! I am sending you healign thoughts my friend!! Let me know if i can help in any way. Separated mine in December snowboarding but was too stubborn to get it looked at – lots of painkillers and anti-inflamatories helped me limp on for the rest of the week. 6 months on and I’m still having trouble sleeping and still in pain. 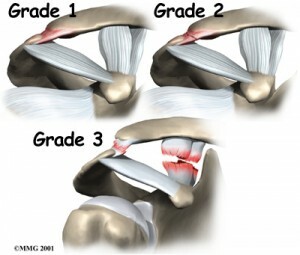 Finally bit the bullet and visited an orthopaedic surgeon today just to have them confirm what I had already figured out – Yup a grade 3 separation. Still sore and unstable but not a lot can be done now except some physio. Does not stop me riding the VFR though. Hope you recover more rapidly than me. Wow, thanks for posting.. the same thing happened in a bicycle accident three weeks ago, I picked up some speed on slippery rocks (about 30-35mph) and tried to do a controlled stop. But not enough to stop me from getting seriously injured. .. Like you I tried doing a roll out of it but now have a PAINFUL level 3 AC Joint separation (in addiiton to a Level 4 ruptured spleen, but that’s ‘nother matter). For the busted shoulder the only thing I have is a sling and pain medication and a big bone sticking out. Like you, I’m going to start physical therapy in about a month, and we’ll see past there. I’m also in my early 30’s (33) so youth is starting to be relative, in regards to sports anyway, lol. Thanks for posting, if anything else comes up regarding your shoulder drop me a post back. I have a type 3 also. But its been 4 weeks now and I am pretty much pain free, and I have ful motion of my arm. Its this normal or am I lucky? It sounds like you’re very lucky! I’m curious what your age is and how you were injured? Thanks for a great blog Amal. I’m 48, recently (6 days ago) involved in an auto accident, another vehicle hit mine while I was pulling out of a parking lot. Transported to the ER, diagnosed with 3rd Degree AC separation. Lots of what I’ve read in your blog sounds very, very familiar to my own situation. Spoke to an Orthopedic Surgeon in the ER who said the surgical option was just that, an option, but not the only option. I”m leaning toward the non surgical route. Haven’t yet consulted with a Orthopedic doc closer to home, but I’m encouraged having read the many, many experiences related by you, and others, on your blog. Thank you for making this information so readily available! Be sure to read my previous comment in reply to Dan. Talk to your doc about the surgical option and what it might mean to you if you got the surgery now, or waited for 2 years to have it. Have him explain everything fully before making a choice. I don’t see any significant loss of mobility in my life at the moment for not getting surgery, but I’m turning 34 soon and I have no idea what I’ll be facing when I’m 64 because of my decision. Make sure you discuss everything. If your doc seems unwilling or impatient, find another one. I was very interested in finding your info on the grade lll ac dislocation. I slipped on ice 12/20/12 and fell on my shoulder and sustained grade lll as well. ER/MD referred me to Ortho/MD ….. I will pass on surgery. I also went to shoulder specialist, rehab doc and general chiropractor. I am impressed how well I’m doing after 8 weeks of conservative care. I am also amazed at the difference of opinions on how to take care of this. I’ve been in a hard athletic tape twice a week. Did you require some sort of shoulder brace after the acute phase? What exercise benefited you the most? What limitations do you currently have? Do you have residual pain?